Thilo Sarrazin, a Bundesbank director who criticized Turkish and Arab immigrants in a recent interview, has been punished by his employer and may lose his job. Apart from receiving threats by Islamist extremists, he may also be taken to court by the German authorities on charges of “incitement to racial hatred.” For many Germans, however, Mr. Sarrazin, who until last May was Finance Minister in the regional government of the state of Berlin for the Social-Democrat SPD, is a hero. His boss, Mr. Weber, however, does not want to become the target of angry Muslims. He has apologized to everyone who might feel offended by the “discriminatory comments” of the Bundesbank official. In fact, the Bundesbank issued a statement, distancing itself in the strongest terms from the interview. It also demoted Sarrazin; he may even be fired altogether. In the Lettre International interview, Sarrazin talked about the economic and cultural situation in his hometown of Berlin. He argued that Berlin has been unable to recover the cultural and economic status and prestige it had before the Second World War. Even its contemporary population figure of 3.2 million is lower than the pre-war 4 million. Sarrazin says that Berlin’s dynamics were broken when the city lost its Jews: the Jewish elite were driven out and instead the city acquired a Turkish and Arab underclass. Sarrazin argued that during the Cold War, ambitious and dynamic people moved away from the highly-subsidized West Berlin while left-wing activists and drop-outs took their place. Meanwhile a Turkish and Arab underclass was imported, which also lives mostly off government subsidies without making economic contributions to the city. An opinion poll indicated, however, that 51 percent of the Germans agree with what Mr. Sarrazin said. Conservative newspapers, such as Die Welt, the Frankfurter Allgemeine Zeitung, and the mass circulation Bild have come to his defense, arguing that he has merely stated uncomfortable facts. Prominent Germans, such as former Chancellor Helmut Schmidt and the writers Henryk Broder and Ralph Giordano, have also spoken out in support of the Bundesbank official. In contemporary Europe, leading a life surrounded by body guards has become normal for people such as Geert Wilders, a Dutch politician who criticizes the Islamization of his native land, and Kurt Westergaard, a Danish cartoonist who made a drawing depicting the Muslim Prophet Muhammad with a bomb in his turban. Thilo Sarrazin has now joined their ranks. Well well well. everything is linear in the Eurab, or EUSSR as many starts calling this European Union. They are now "smuggling in" the constitution which was rejecte by France, Ireland and others, as a "treaty". And in this european temple of democracy and freedom the penalty to death, is reintroduced in case of war, riots and upheaval. Great! I won't be surprised if the sharia will permit cutting the thiefs hand, permit poligamy with children and stoning to death a woman having commited adultery. 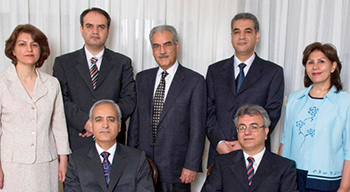 More than five years ago, the government of Iran arrested the seven Iranian Baha'i leaders known as the Yaran (which means "friends" in Persian). The seven prisoners, who committed no crime other than being Baha'is, were charged with espionage, propaganda against the Islamic republic, and the establishment of an illegal administration -- charges that were all denied categorically by the defendants. They were sentenced to 20 years each in prison.